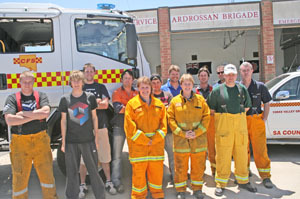 A couple of months ago, Ardrossan’s Country Fire Service brigade had only eight members and was struggling to crew but, thanks to relentless campaigning, the station has 11 new recruits. Eight of these new faces completed their introductory training on Sunday, November 23, and can now assist the brigade with call outs. Port Clinton also had two new members training at the Ardrossan station on Sunday; Corny Point and Yorketown had one each. Ardrossan brigade captain Greg Vandepeer said the new recruits would solidify the town’s station for years to come. New CFS recruits for Ardrossan and elsewhere, Daniel Pearson (Port Clinton), Luke Liddiard (Corny Point), Dylan Hancock (Yorketown), Brad Oster, Melanie Elsworthy, Jamie Elsworthy, Todd Oster, Pamela Markof, Nick Lodge, Nicholas Carty, Matthew Jones, Andrew Airey (Port Clinton).